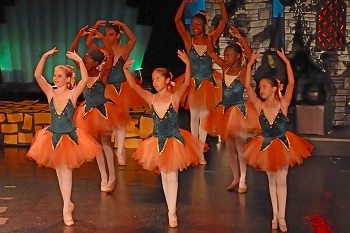 The dance experience includes studies in ballet, tap, jazz, dance history, dance terminology, career awareness, choreography, technique, sequencing, memorization, structure and function of the body, peer relationships, self image, technical theater, rehearsals and productions. The program helps to develop problem-solving abilities, a greater sense of self-awareness, increases concentration and focus, fosters respect of others as well as enhances cognitive development. To encourage career awareness in dance, students research famous choreographers and dancers as well as exposure to guest artists and school/community workshops. 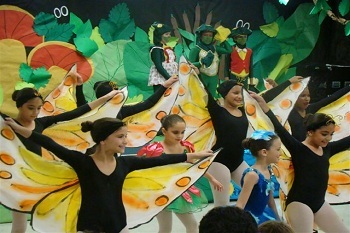 Dancers perform throughout the year in school and community venues, culminating in a dance production. Dance is a fun discipline that teaches the body and mind to work together as one. Dance is for all students, and boys are strongly encouraged to apply! Previous formal instruction is not required to audition. Demonstrate exercises presented by the teacher which show range of movement, flexibility, strength, alignment, balance, coordination, and elevation. Demonstrate locomotor skills and exercises which show spatial awareness. 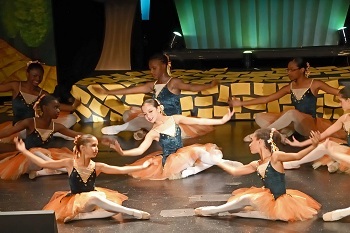 Perform a combination taught by the teacher to test memory,	musicality, artistic expression and	coordination. Need to dress in appropriate dance attire for the audition. Girls: leotard, tights and dance shoes. Boys: black leggings, white shirt and dance shoes. Hair must be pulled away from the face. If your child does not take dance classes, please have him/her wear close fitting clothing which stretch.